Dachshunds are extremely loyal and are good as watchdogs. Dachshunds were basically bred as hunters in Germany centuries ago, so it is no surprise that many of them like to dig. Hence it got its name where ‘Dash’ means badger and ‘hund’ means dog. A dachshund has strong, short legs that enable him to dig out prey and go inside burrows. This canine comes in two sizes – standard and miniature and is available in three varieties – smooth haired, wire haired and long coated hair. These breeds display unique physical features with long backs and short muscular legs. But despite their size, dachshunds are known for their courageous nature and will take on animals much larger than themselves. They are good with children if treated well. But at times they can be slightly difficult to train. If now you are planning to bring home a dachshund, there are dachshund puppies for sale in Alabama. Once you own a dachshund, there are some things you should remember in order to become an ideal dachshund parent. Remember that dachshunds are naturally prone to a disorder known as IVDD (intervertebral disc disease). This is a hereditary disease and may or may not develop in your dachshund. But if it develops, regardless of how careful you are, she can get a spinal injury in back or neck. It’s better to minimize activities like jumping that can exert pressure on her long back since they can aggravate the problem. However, it should also be remembered that you don’t need to keep dachshunds totally inactive. Activities like hiking, Earth Dog and agility can make their backs strong and keep them supple. As dachshunds are short, they are close to the ground. So, rainwater doesn’t only fall on them but even splashes them from below. Your pet may resist if you try walking him in the rain. Also, if there is snow in your yard, you should shovel a path. Also a waterproof warm jacket made to fit your pet can make him comfortable while going out in the rain or snow. If you start walking him in the young age, he may learn that it’s tolerable. However, since dachshunds have a strange shape, it’s hard to find a jacket and even a harness that fit them properly. You may get a custom-made jacket and harness for your dachshund. 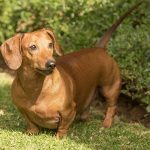 Dachshunds are prone to certain other diseases too like dental disease, seizures, Cushing’s disease, alopecia and patellar luxation. Regular visits to vet are important to ensure your pet is in good health. Hopefully with these tips you can become a proud dachshund owner.